The Brittany Spaniel is clearly the best dog in the world. These loyal and affectionate dogs respond well to training and are hardy and energetic. These HPR dogs (Hunt, Point, Retrieve) are healthy and long-lived too. Requiring plenty of exercise and mental stimulation, the Brittany does not like to be left alone too long. 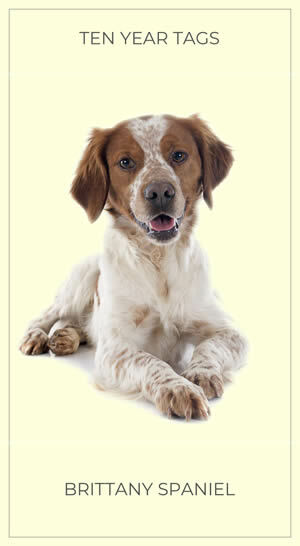 The Brittany Spaniel is also extraordinarily handsome. Buy Your Brittany Spaniel a Deeply Engraved Solid Brass Dog Name Tag Today!